In just 100 days both Keystone Resort and Breckenridge Ski Resort will open for the 2017-2018 winter season on Friday, Nov. 10, 2017. Keystone will be open for the winter season through Sunday, April 8, 2018 and Breckenridge will be open through Sunday, April 22, 2018. 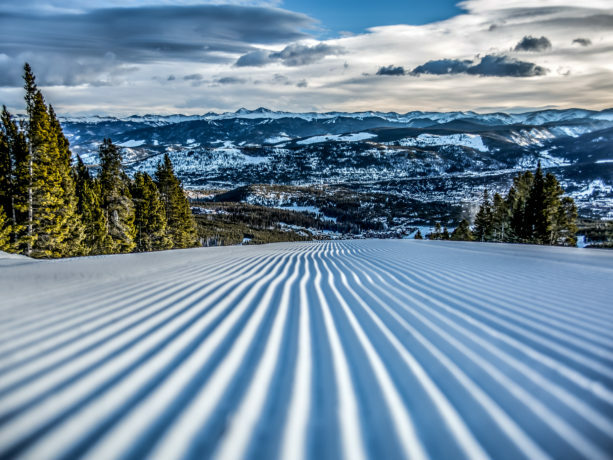 Keystone Resort and Breckenridge Ski Resort have been hard at work on capital improvements this summer to reinvest in the winter mountain experience for guests. At Keystone, the Montezuma Express Lift, a primary lift on Dercum Mountain that serves popular beginner and intermediate ski terrain, is being replaced with a new high-speed, six-passenger chair that will increase efficiency and capacity by up to 25 percent, while improving skier and snowboarder circulation on the mountain. Keystone is also renovating and expanding Labonte’s Smokehouse BBQ with a new, 190-seat indoor facility for the on-mountain dining venue – perfect for family diners. Located at the base of Keystone’s North Peak, Labonte’s is a popular restaurant serving house smoked meats and barbeque during the ski day. At Breckenridge, the Falcon SuperChair on Peak 10 is being replaced with a new high-speed, six-passenger lift, offering an easier and faster ride up the mountain. Peak 10 is a popular area for advanced skiers and snowboarders providing access to fun and challenging terrain, easily accessed from the Peak 9 base area. This upgrade is another milestone in a wave of recent capital improvements at the ski area geared towards enhancing the guest experience – including the opening of Pioneer Crossing, a new 490-seat restaurant on Peak 7 last season; an upgrade of the Colorado SuperChair in 2014; and 500 acres of new terrain on Peak 6 in 2013. If that’s not a sweet enough treat, Breckenridge’s Ten Mile Station is going “Willy Wonka” this season, adding a “Candy Cabin” offering an array of your favorite chocolates and sweets, and Pioneer Crossing is adding sweet and savory crepes to its breakfast lineup this winter.